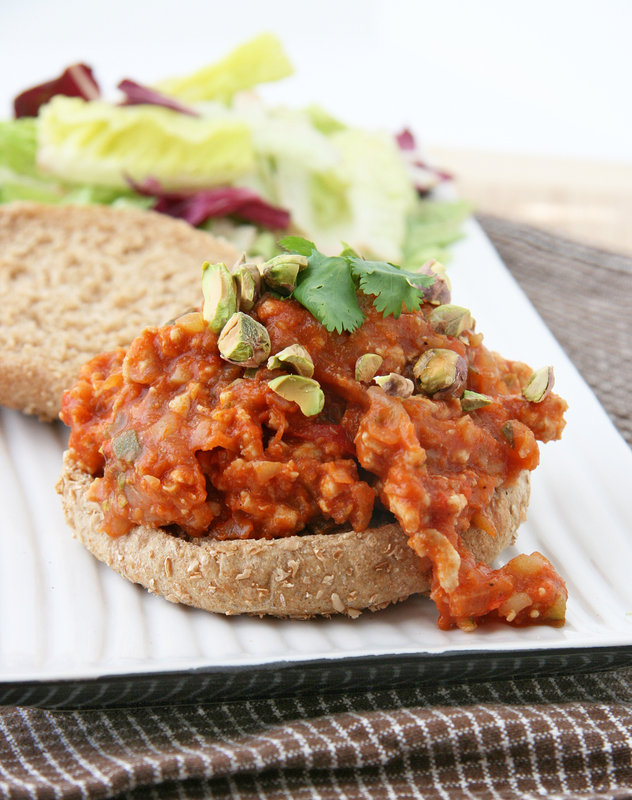 Move over Manwich, this Indian-inspired sloppy joe has got you beat by a long run! I’ve been trying to cook more ethnic-inspired meals and experiment with various spices to mix things up at our house. I’ve fallen in love with Indian cooking and recipes, thanks to Aarti Seqeuira of Aarti Party on Food Network. Just like the Kheema (Ground Meat with Peas) I made recently, Chris and I adored last night’s meal of “Bombay Sloppy Joes” from her show as well. As usual, I switched up a few things but the bulk of the recipe stayed the same – I decreased the amount of oil used and use refined coconut oil (love this stuff), increased the amount of a few spices, added zucchini for more green, omitted the raisins, increased the onion, subbed jalapeno for the serrano and simplified a few steps for a quicker meal. I didn’t have raisins on hand but next time would like to try adding dried currents or cherries to the meat mixture and eliminating or decreasing the added honey. The pistachios in the this recipe are a must, they add great texture to the meat mixture…if you don’t have pistachios, almonds or walnuts would make a good replacement. I used my food processor to quickly chop the onion, bell pepper and zucchini which helped cut down on the prep time. 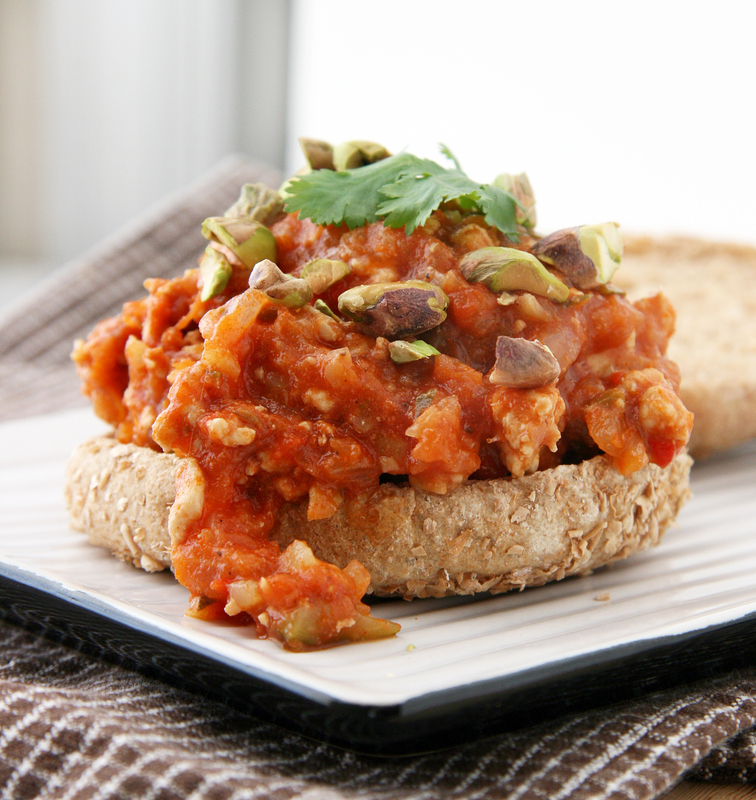 Just as the name promised, this meal is sloppy but SO delicious and packed with layers of complex flavors. The sauce has a lovely taste of ginger and garam masala so when married with the cumin, vegetables and meat in the skillet – this dish is a total keeper, no question about that! 1. Begin by making the sauce: Warm the oil in a medium saucepan over medium heat, until it shimmers. Add the ginger, garlic and jalapeno pepper. Saute until the ginger and garlic brown a little. Add the garam masala and paprika and saute for 30 seconds. Stir in the tomato sauce and water. Bring to a boil, then reduce the heat and simmer, uncovered, until thickened, about 15 minutes. 2. Meanwhile for the meat, in large skillet, warm 2 tablespoons of oil, add 1 to 2 tablespoons of oil, and warm until shimmering. Add the cumin seeds and allow them to sizzle for about 10 seconds, or until some of the sizzling subsides. Stir in the onions and bell pepper; saute until softened and starting to brown. Add the zucchini and jalapeno pepper. Saute for another couple of minutes, seasoning with a little salt. Stir in the ground meat, breaking up the big lumps. Cook through, about 5 minutes. 3. By this time, your sauce should be ready. Pour the sauce into the skillet with the meat mixture. Stir and bring to a boil, then lower the heat and simmer until the mixture has thickened slightly, about 5- 10 minutes. 4. Add the honey and stir through and taste for seasoning. For serving, toast the buns, fill with meat mixture then garnish with chopped pistachios and fresh cilantro (or you could stir both in the meat mixture prior to filling bun).Eat (with your hands!) and enjoy! *Recipe Variations: If you want a bit more sweetness, add 1/4 cup raisins or dried currants, cherries or cranberries to the meat mixture for a slight variation. You can also use yellow squash in place of zucchini or leave this out completely – I like the bulk up the veggies! LOVE Indian food – so many wonderful flavors and spices! Quinoa is a great base, I love how versatile it is with various cuisines! Sounds delicious. I think I haven’t eaten sloppy joes since I moved out of home. Wow, I must rectify that! Thanks for the inspiration. Thanks Ali! Next time I make this, I’ll save you a sandwich! Thanks! I’d love to hear your feedback if you get around to trying this recipe! We love this dish and plan to make another batch soon! Oh my God. This looks and sounds amaaaaazing. 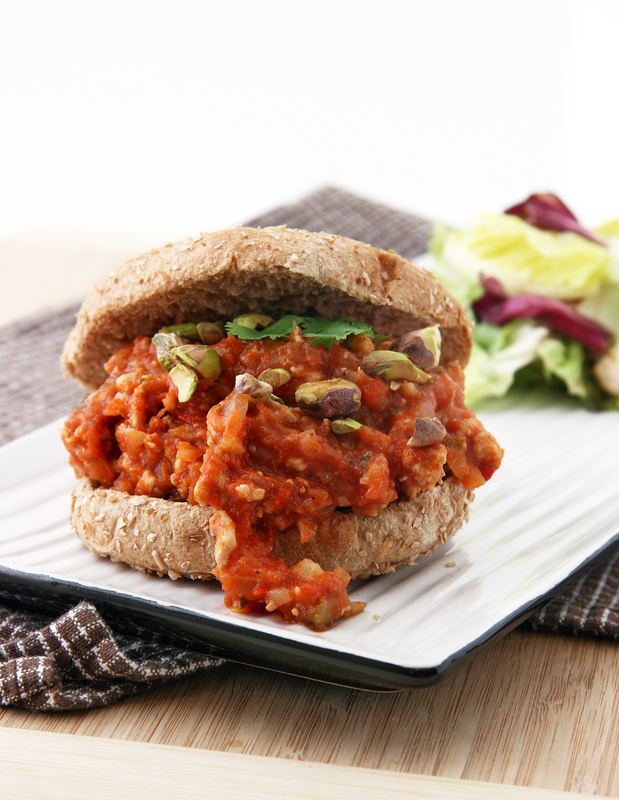 I also thought the idea of a sloppy joe in its original form was rather dull and uninspired but this recipe makes something I have simply avoided now seem totally tempting! Thank you for sharing this! Aww thanks Juls! I’m with you – traditional sloppy joes never really appealed much to me, maybe because I was scared of the canned version. This dish is unique and yummy!